Buy iTunes Gift Card 25 Dollar for Itunes on GGlitch.com | Fast, secure and easy! 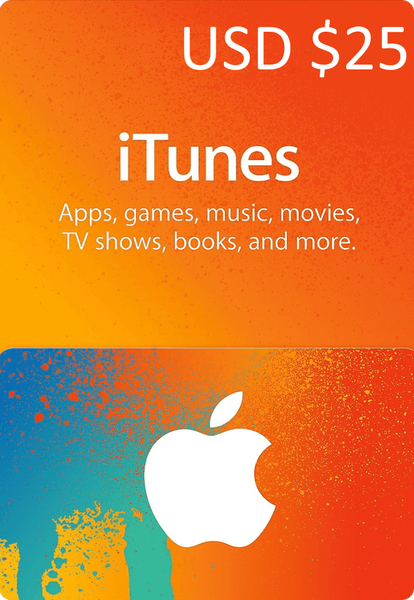 Add funds to your Itunes wallet easily and conveniently with these US dollars gift cards! With the credit from a gift card, you can get music, movies, TV shows, apps, books, audiobooks, Apple Music memberships, iCloud storage, and more. When you redeem an iTunes Gift Card, the amount on the card credits to your Apple ID. You can use the credit in the iTunes Store, App Store, or iBooks Store as long as you sign in to each store with the same Apple ID. The credit is used for each purchase you make in a store until it's gone.